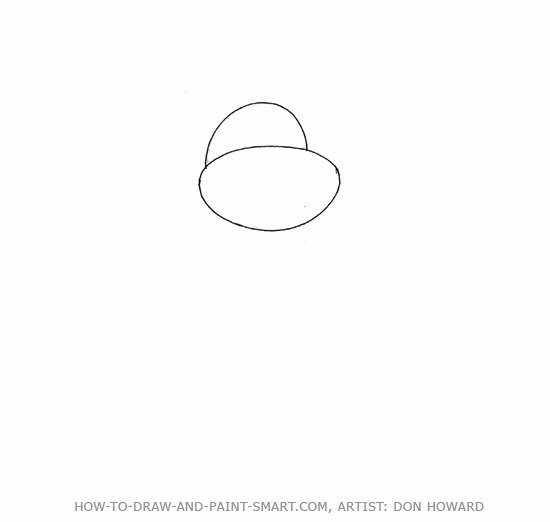 How to draw a cartoon bunny rabbit. 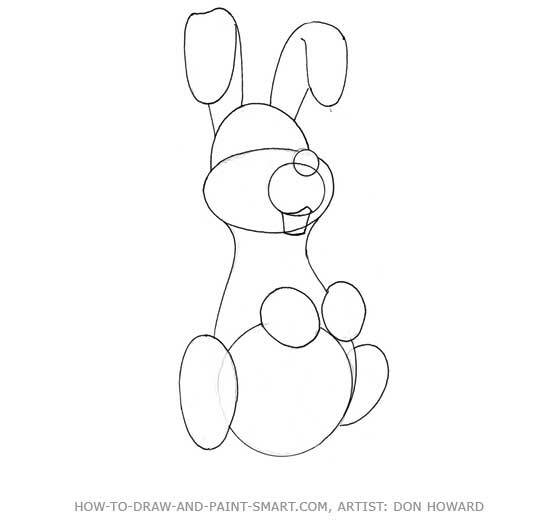 Whether you want to know how to draw Bugs Bunny or how to draw he Easter Bunny, the secret is all in the shapes. 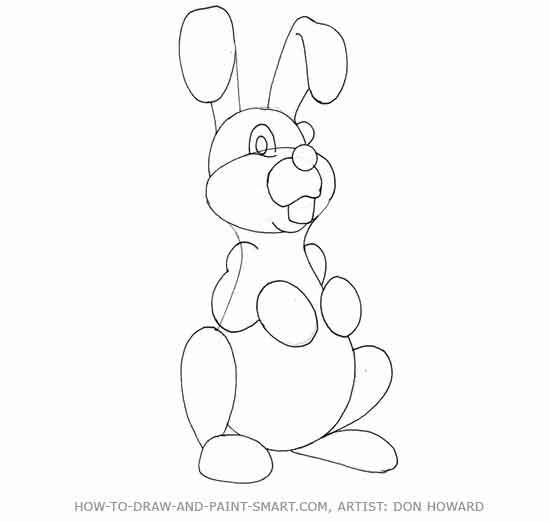 Get your bunnies shapes worked out and pop some ears on the "wascally wabbit" and you will have yourself one fine bunny drawing. Bunnies are some of the cutest animals around and rabbits can make good pets too. When I was growing up my neighbor kept rabbits in this back yard. They were so cute and soft to pet. We'd have fun feeding the rabbits grass through the fence. You can imagine the horror I felt when I learned that they were being raised for food... Yup, these cute bunnies were destined to be my neighbors supper. That revelation was just one of the many things I had to learn about the food chain. If you prefer rabbits as pets rather than supper, bear in mind that they have a rather long life-span and they need a good cage and periodic veterinary care. Keeping your rabbit healthy and happy is important. With a pet rabbit on hand you will have a great reference to make your drawing of a bunny. If it's the easter bunny you want to draw, you'll have to surround him with colorful easter eggs and chocolates. I personally prefer not to eat rabbits unless they are chocolate rabbits. Bugs Bunny, the famous Warner Brothers cartoon character is still one of my favorites. You could always count on Bugs to outsmart Elmer Fudd, martians, monsters, you name it. Drawing bugs also comes down to getting the shapes worked out first. If you want draw bugs bunny, you may want to check out the book "Draw the Looney Toons." 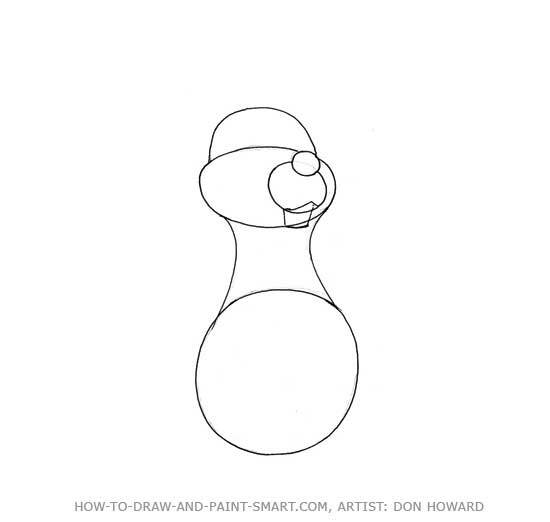 Now let's get started with the "How to Draw a Rabbit"
Draw the shapes for your cartoon rabbit head. 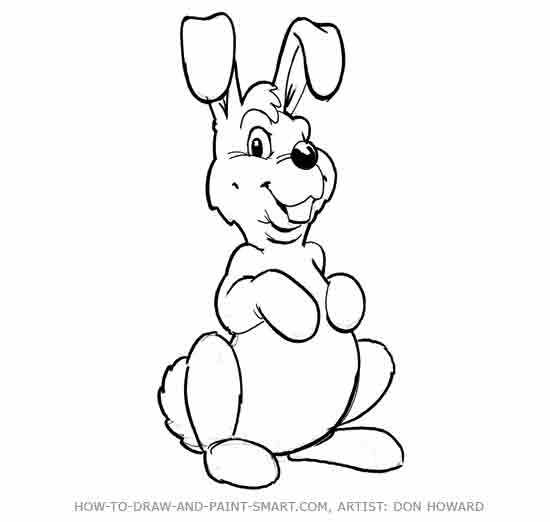 Add a circle for the rabbit's body and connect the head to the body with some curves. Add a cute bunny nose and a rectangle for the teeth. Now add some big bunny feet and some arms. Also place the rabbit's eyes and chin. We are a;almost done with how to draw a Rabbit. Refine your drawing by adding a smile, a tuft of fur on his head and some more detail in the ears and on the face. Also fill in the top of the arm and draw a shape for the cotton tail. 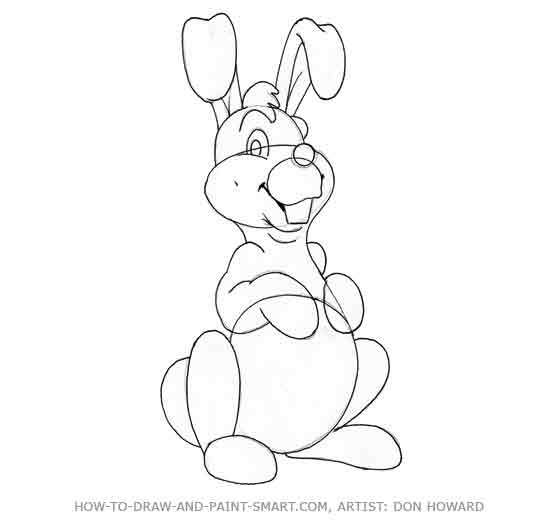 Using a marker or dark pencil, outline and refine your rabbit drawing further, Darken in the eyes and nose leaving a white spots for the highlights. Some creases in the ears and under the eyes will add expression. Make your outline a bit jagged in places where you want to indicate fur. "How to Draw a Rabbit!" Where can I learn more about Rabbits?